18/05/1991: 96-82-87 = 265 points. Overall Build: Powerful constitution; pronounced gender type; very good colour, very good markings; normal developed testicles; front line and rear line parallel; scissor bite; eyes appropriately set, medium-sized, oval and medium brown; correctly styled and cropped ears, strong and appropriately built neck; strong forehead; long and firm back; very good croup; very good chest depth; very good chest width; very good rib curvature; very good fore-chest; normal underline; good front and rear angulation; correct upper arm length; shoulder blade angled; good elbows; correct pasterns; good stance; paws slightly long; powerful bone; well positioned thighs; knees in alignment; rear feet set outward; strong hocks; short closed paws; strong joints. Inharmonious front gait; sufficient far-reaching rear gait, good rear push, good firmness in joints. Nature: Spirited; naturally calm in the group; open and sure with sound exposure, unconcerned with gunshot; middle sharpness, very high protective instinct, fighting spirit and courage, high hardness. No limitations for breeding. Ilo von der Weyermühle passed the Erstkörung with highest ratings for courage and working drives (very high protective instinct, fighting spirit and courage, high hardness and middle sharpness). He lived to 10 years of age and tested clear for PHTVL / PHPV and heart problems. His sire, Amor von der Weyermühle, lived to 12 years of age while his dam, Gina von der Weyermühle, passed away at 8½ years of age from cancer. His grand-dam Cona von Niederkassel lived to 14½ years of age. The same combination as Ilo also produced Kleo von der Weyermühle: German Police K-9, SchH 3, FH, IDC-Weltmeister and passed the ZTP with 1A rating for character and SG for conformation. 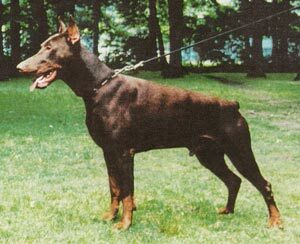 She is dam of the von der Doberwache “A, B, C” litters (Amatzon, Bronco, Bastian, Bingo, Brista, Branca, Biene, Chico). Noami: IPO 3, FH 2, DV-DM participant, Landesmeister Niedersachsen in 2001 and FH Landesmeister Niedersachsen in 2001/2003/2006. She is dam of the von Warringhof “B, U, Y” litters (Urs, Yette, Yango). Andie: dam of the vom Tanzenhaus “C” litter (Calvin, Cate). Pegrim: IPO 2 and sire of the von Warringhof “W” litter (William) and von der Sonnenleite “D” litter (Donak). Saxo: dam of Jotunheim's “D, E” litters. Signe: dam of Briska's “T, X” litters.